Illustrators are people who draw and paint, digitally or traditionally, for a range of industries. From technically realistic medical illustration, to bright engaging children’s book illustration, artists who are good at conveying messages through art often build careers in illustration. Are you able to work for yourself? While it might sound like fun to work for yourself, consider the business side; clients must be found, deadlines must be met, bills have to be sent out for accounts to be paid, and taxes have to be figured. Are you relentlessly motivated? Illustrators, especially in free-lance markets, have to constantly put out new things to get attention. If you aren’t willing to produce artwork (even when you aren’t getting paid), then you will quickly fall by the wayside. Can you draw for others? Most aspiring illustrators don’t realize the projects that pay money might be straight up boring. Clients often want multiple revisions to your artwork, and sometimes the changes aren’t what you want. As an illustrator, you must be ready to do a lot of work that you may not feel inspired to draw; producing a picture for someone else’s project is what you are hired to do, after all. While education is not required for most illustration jobs, it will go a long way in preparing you and fleshing out your resume. 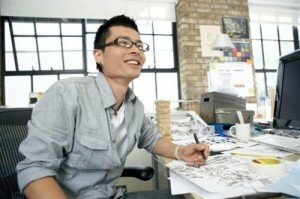 With a lot of competition in the illustration market, choosing a degree will set you apart from the crowd; a degree in illustration give experience and expand your portfolio, a degree in fine arts exposes you to all kinds of materials, and a degree in graphic design will give you an understanding of layout and packaging principles. Artists who illustrate for children’s books need to have a captivating and colorful approach. A guide to children’s book illustration will tell you each publishing company’s requirements for submitting your work. You will have to submit your work without giving up; rejections are very common in publishing companies. A typical contract for a book would be 5 percent royalties for an illustrator. Many book illustrators hire an agent to help them find work. Careful attention to detail and a love of science are needed for a profession illustrating for the medical community. Requirements in this field include an advanced education: a bachelor’s degree in art and biology and a master’s degree at graduate program accredited by the Commission on Accreditation of Allied Health Education Programs (CAAHEP). According to the Association of Medical Illustrators (AMI), the average salary for a medical illustrator is $61,000 and can reach $150,000. Realism and instructional illustration is done by technical illustrators for industries with mechanical, manufacturing, engineering, architectural, and scientific needs. Usually a degree in technical illustration, graphic design or other related field is required, and a focus in science is helpful. An in-house illustrator with less than 3 years experience has an average salary of $30-40,000. Specialized illustrators (focused in one specific area) with 5 or more years of experience make $50-80,000 a year (Graphic Artist Guild Pricing and Ethical Guidelines). In a vast range of styles, an illustrator working for editorial, publishing or advertising industries uses their talents to communicate all types of subject matter. From humorous to realistic, abstract or cartoon, a commercial illustrator is able to work with clients to produce illustrations for labels, magazines, books, websites, and much more. This typically requires a degree in illustration or graphic design, and a strong portfolio is important. Illustrators make their salary based on what jobs they are able to get—working in-house is unusual.